On Saturday night I made dinner for Dana and I: roasted cauliflower dressed in ghee, cumin, turmeric and two of our homemade curry spice mixes with mustard seeds. Then kale with goat cheese, hot pepper and a dusting of cumin and curry. For dessert I made biscuits which I planned to use again in the morning for breakfast. For the meal pictured I started with a bed of arugula, drizzled olive oil, sprinkled salt, black pepper and hot pepper and then grated some amazing raw cheddar cheese from Vermont. I fried up some eggs and toasted the biscuits. 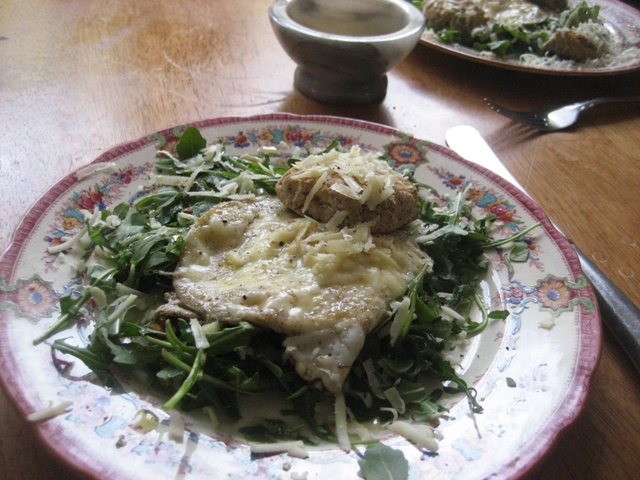 The eggs go on top of the greens and then I grated more cheese on top of everything. A quick meal with plenty of protein and even a serving of greens! Coming soon: my cookbook based on the recipes in this blog and a new class series, “Healthy Living in the Berkshires” which will be hosted by Bisque, Beads and Beyond on North Street starting with two information and sign up sessions May 23rd and 24th. Mark your calendars and stay tuned! Previous Veggies and Egg Pancake with Peanut Curry Sauce Next What’s Wrong With The Kids?